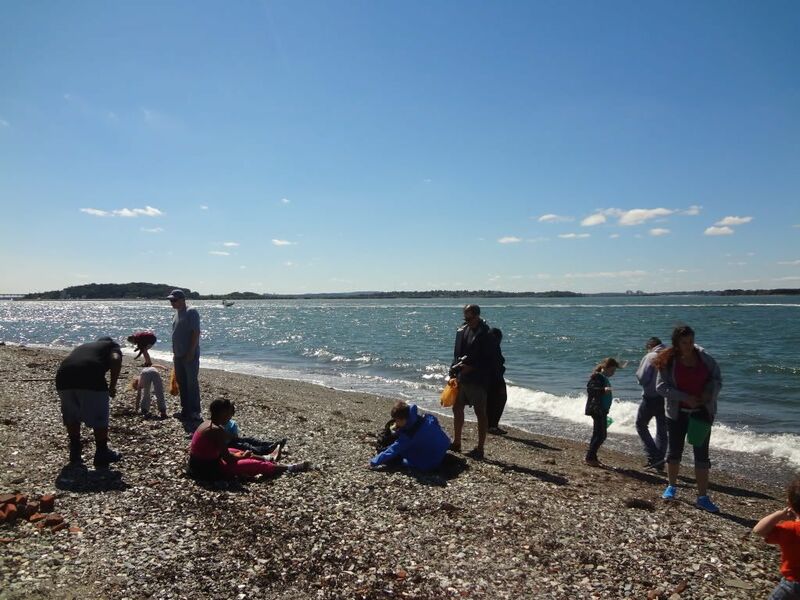 On Saturday, September 15, I joined Save the Harbor / Save the Bay and 278 guests on a free trip to discover the Treasures of Spectacle Island in the Boston Harbor Islands National Park. 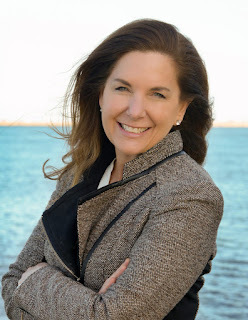 While on the island, I had a chance to shoot this interview with Dr. Ellen Berkland of the Department of Conservation, conducted by Save the Harbor's Bruce Berman. Ellen has been doing work on Spectacle since long before it was turned from a landfill into a popular park, and she offers a unique perspective on the history of the island. Her stories of the time she has spent and the people she has met on Spectacle over the years are truly remarkable. You can see more of my photos from the trip and the summer - and other photos taken by our other interns as well - at Save the Harbor's photobucket site. 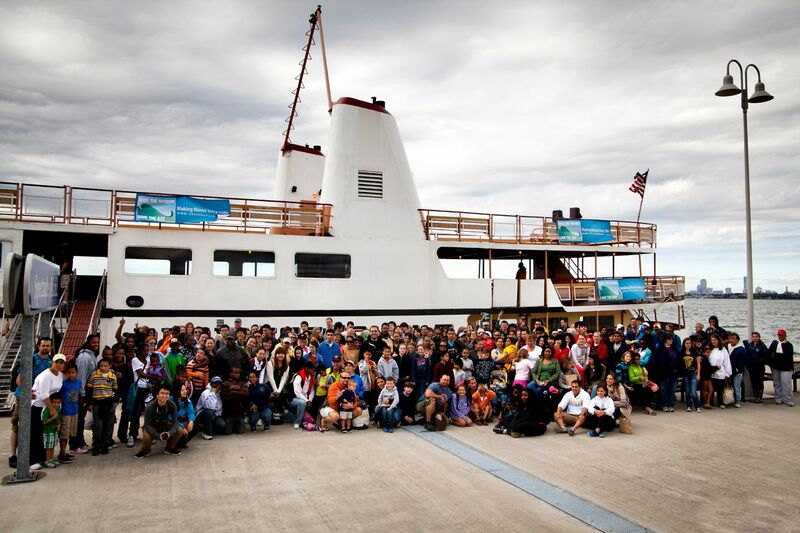 On September 15, 278 guests joined Save the Harbor / Save the Bay on the Treasures of Spectacle Island trip. While some groups did not get a chance to explore the wonders of the beach due to the high tide, many were fortunate enough to get down to the beach in the early afternoon as the tide started to recede. Lots of historic artifacts were uncovered on the beach - ranging from tiny marbles to large chunks of 50-year-old toilets! 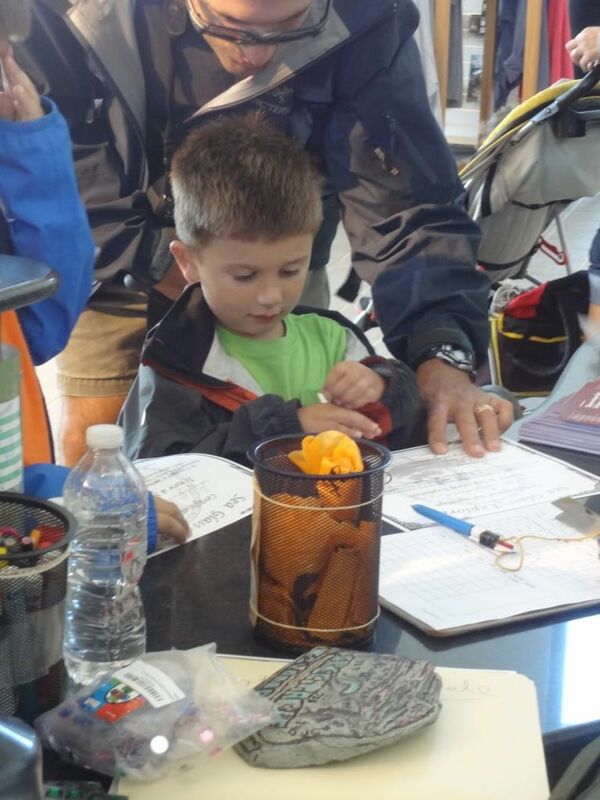 Bruce Berman helped families identify their findings and showed them what was trash and what was treasure. Unfortunately for the kids, they found out that all the artifacts they unearthed on Spectacle must remain there, and could return home with only their memories from their fantastic day on the island. On Tuesday I spent the day at Carson Beach committing what would be a crime in my home state of Nebraska! I started the day by arriving at McCormick Bath House to welcome the Blue Crew from Massachusetts Blue Cross Blue Shield team. 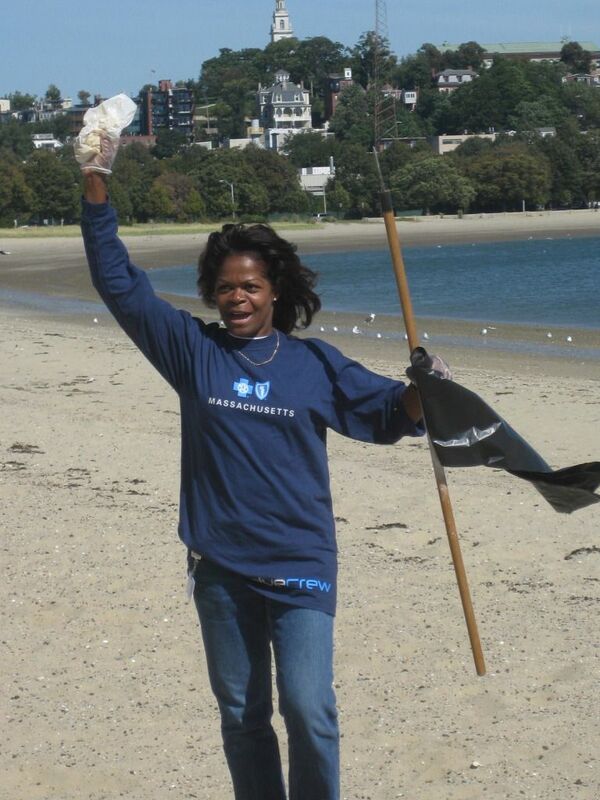 The whole team was pumped to help keep Boston’s beaches the cleanest urban beaches in the nation. I was also excited to help out so I picked a team who was assigned to clean out the beach grass that outlines the boardwalk. 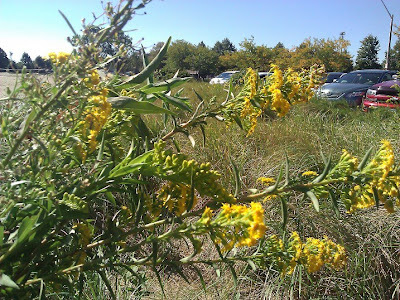 Not knowing what I was getting myself into, we grabbed our tools and gloves and headed to our site only to find the Goldenrod flower growing in every direction. As I stood there to take in the view of the job ahead of us, I finally put two and two together. I realized that according to the directions of the DCR we were suppose to pull everything but the sea grass, which meant the goldenrod had to go. As a native Nebraskan this is task that I could be ticketed for if I were still living in the “Good Life” state. For those of you that don’t know, the Goldenrod is Nebraska’s state flower and is illegal to pick in the state. So here I am on Carson Beach being asked to pluck this flower out of the ground and I realize how interesting it is. If the Blue Crew had been cleaning up a state park in Nebraska they would have been asked to pick everything but that flower whereas being in the state of Massachusetts it is considered a weed and invasive.Even though the Goldenrod is beautiful the Blue Crew made Carson Beach sparkle again. 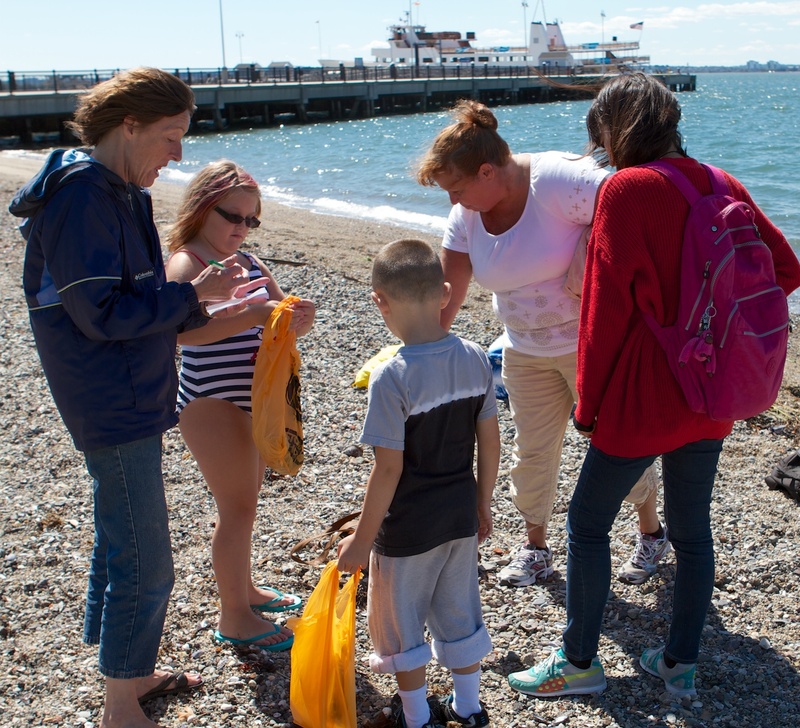 We all walked away with pride in the amount of work we accomplished and good cheer from being on South Boston's beaches for a day. In addition to this weeks adventures it is also the week that I say good bye to Save the Harbor. I had an amazing summer and learned more about the harbor and its importance than I would have anywhere else. I would like to thank everyone that work at Save the Harbor, especially Bruce and Patty. You guys were awesome, a great support, and provided a wonderful introduction to the city of Boston. Thanks again and I hope to see you out on the harbor soon! Tuesday was the perfect day, the sun was shining in a brilliant blue sky, and the breeze a perfect mix of salty ocean air warmed by the sun blowing in over sparkling blue waters. 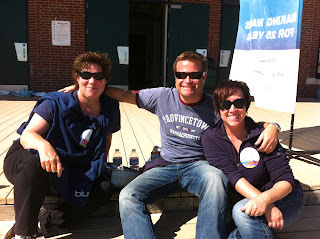 Even the sand was blue- with our dedicated partners from Blue Cross Blue Shield that is. Save the Harbor / Save the Bay and Blue Cross Blue Shield came together to do our part to keep Carson beach clean. 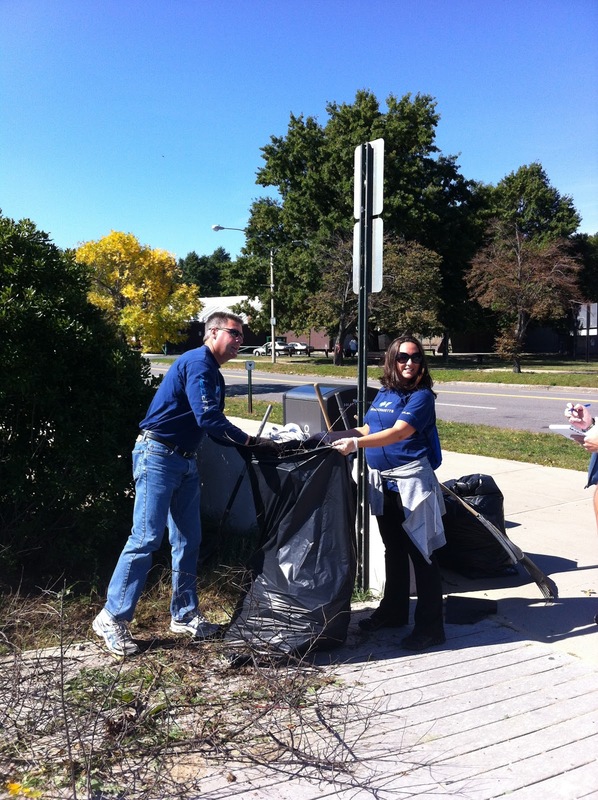 Blue Cross Blue Shield participated with us as just one part of a larger effort including thirty projects, 1600 hours, and 3000 participants in a statewide cleanup effort. Working with the Massachusetts Department of Conservation and Recreation, we were placed into eight groups and to spread out so each group could take a section of the beach and cover more ground. The BlueCrew hard at work cleaning Carson Beach. My group was assigned the far side of the beach near the seawall. Our mission was to pull weeds and pick up any trash. Once we arrived to our section we split into groups of two and we got to it. It was nice seeing people from other communities coming together to keep the Carson Beach landscape beautiful. As we prepared to head back for lunch our group took a moment to see what we had accomplished with just a few hours of hard work. BCBS employee Jackie Bliss stated that it was amazing the difference from when we started. Jackie Bliss, Greg Ciagelo and Jackie Kenney from BCBS. During lunch, I talked with Greg Ciagelo of Somerville. We spoke about how it’s great that the water is now clean so people can swim at the beaches, but that there’s still much more to do. We need to continue to maintain the beaches so visitors can enjoy them for their recreational purposes. I agreed with him-it’s one thing to be able to swim at the beach, but if the sand is dirty or the facilities are not in good condition then it limits other activities that these beaches can provide. After lunch, the teams spent another three hours beautifying this relaxing space just minutes from downtown Boston. Performing service to better our community is rewarding in itself, having the opportunity to meeting the employees from Blue Cross Blue Shield and be a part of their cleanup project made the day that much better. 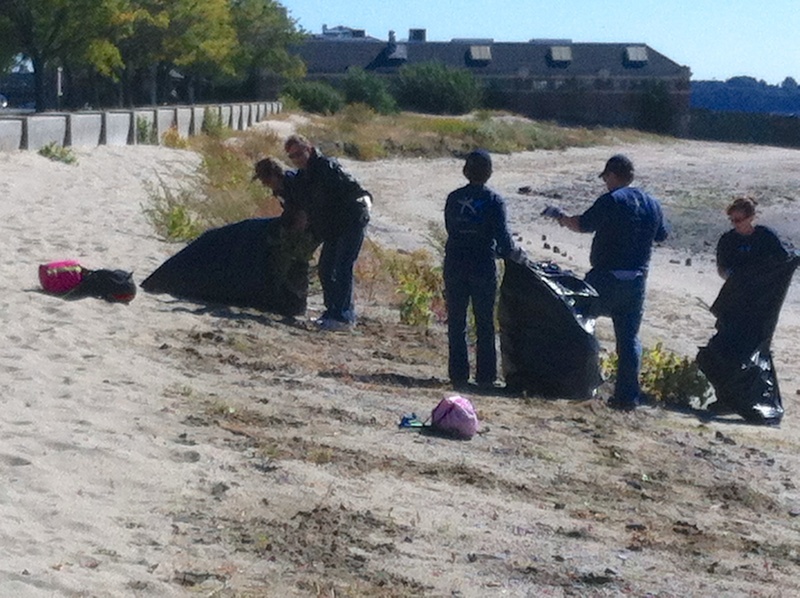 There can't be many better ways to spend a workday than cleaning up a beach on a beautiful, sunny fall afternoon. 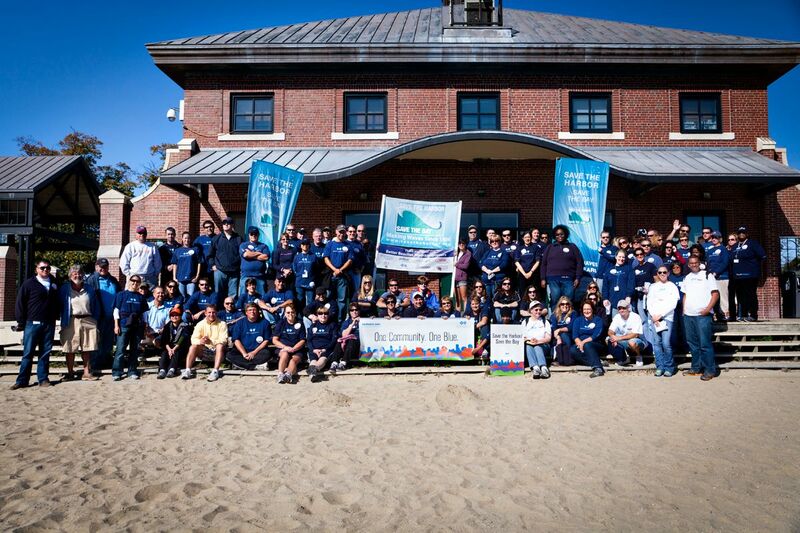 Save the Harbor was lucky enough to join nearly 100 BlueCrew members from Blue Cross/Blue Shield in a clean up on Carson Beach this Tuesday. This is just one of the many volunteer efforts of Blue Cross/Blue Shield as part of their Massachusetts Service Day projects. The crew was divided into 8 teams and scattered to cover the entire stretch of beach. I hopped in to join "Foley's Team," dubbed for group leader, Tom Foley of Somerset. We headed out towards the gazebo, working our way back towards the center of the beach. Our group had a great attitude, smiling and joking the entire day. Foley served as a great leader, eagerly pulling out weeds along the beach and cracking jokes with his peers. We were so efficient that we finished our area by lunchtime! There were roughly 10 bags of trash and weeds from our group by this time already. Our spirits were high and our tummies ready for lunch. But on the walk back to the beach house, a stray plastic bag started making its way towards the water. Odette Palmer-Lee of Boston quickly ran off to catch it, and returned with the grin of success on her face! Odette Palmer-Lee captures her prey- a stray plastic bag! After our lunch break, we continued our weeding efforts for the rest of the day before joining the rest of the teams for final reflections and much-deserved praise of the BlueCrew's service accomplishments. I think it's safe to say that everyone had a wonderful time spending their day chatting with friends, enjoying the weather, and working to make Carson Beach an even more enjoyable amenity of Boston. "Foley's Team" with Chris Davis, Odette Palmer-Lee, Sean Sullivan, Claire Tigges, Tom Foley, Todd Linsky, Cori Linsky, and Holly MacMillan. 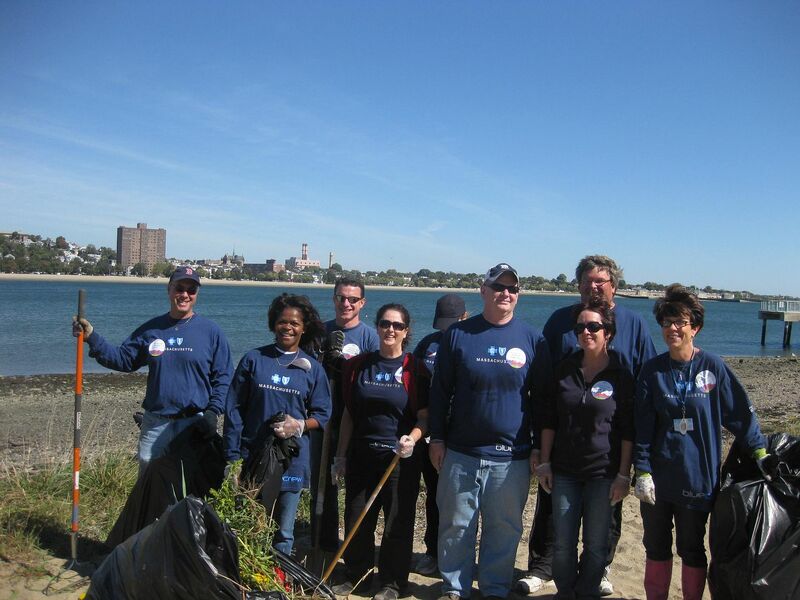 On Tuesday, September 25, nearly 100 Blue Cross/Blue Shield employees joined Save the Harbor/Save the Day for a day of service, helping to clean up South Boston’s Carson Beach. The Blue Crew’s participation in the project contributed to their 16,000 hours spent on 30 service projects across the area. Among the many participants were expectant mother Jill Aiello, of Pembroke. 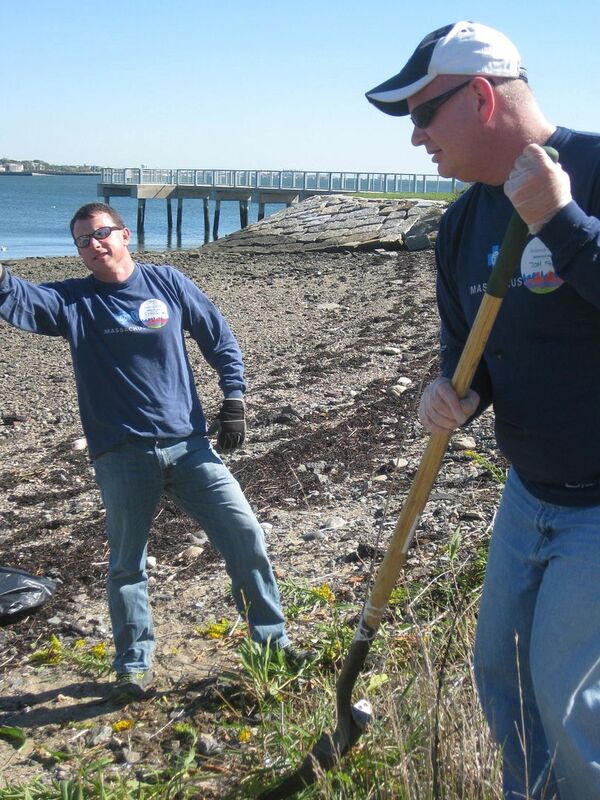 Jill along with Scott McLaughlin of Scituate worked to trim dead branches and bushes that lined the beach. Both were enthusiastic about the event and were happy to spend the beautiful day outdoors. Similarly, Donna Fox of Weymouth, and Paul McNulty of South Boston, also put in a lot of hard work cleaning up the park adjacent to the beach. As I joined the friends in their efforts, I was shocked by the amount of broken bottles scattered in the grass. Before the Blue Crew had a chance to help clean things up, it would have been dangerous for anyone to play in the park, because of all the sharp glass pieces. 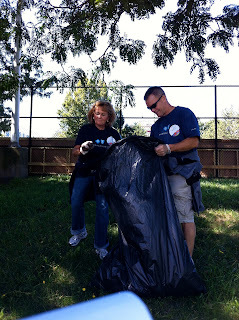 Luckily, Donna and Paul were there to do their part and make the park a safe environment once again. Overall, the Blue Crew and Save the Harbor helped to clean up nearly a mile and a half stretch of beach. It’s important to keep the beaches clean because they are free for the public to use. Maintaining their cleanliness ensures that families and individuals will have them available to use for many years to come. What made the day even better was the beautiful weather we were treated to. The sun brightly shone for the entire day, which encouraged people to work even harder. I have to say it was amazing to see the difference in the beach by the end of the clean up! BlueCrew Cleans Up Carson Beach! McCormack Bathhouse before getting started. Yesterday began with a rousing chant, as about 100 Blue Cross Blue Shield employees joined Save the Harbor / Save the Bay on Carson Beach in South Boston for a day of service. The effort was part of Blue Cross Blue Shield of Massachusetts' Service Day, and this year marked the 75th anniversary of the company's service. DCR's Jack Kelly welcomed the group beneath sunny skies and tasked us all with a variety of beach clean-up tasks. The group was divided up into eight different teams and quickly set out to various points along the beach to get started. I had the privilege of joining “Team D”; we started near one of the beach walkways (on the Google Maps satellite image, it appears across from G Street), pulling everything but one particular plant, called Mayberry. Don't worry - none of us knew what this was at first either! A little research shows that Mayberry is more commonly known as Elliott's Blueberry, and is, as it sounds, a member of the blueberry family.1 In our work time during the morning, we cut back overgrown brush, weeded out sea grass and picked up trash among other things. I have to say, I think I was pretty lucky – my group was filled with enthusiastic, hard-working volunteers, and in their company, time flew by. Ronnie shows off our morning's handiwork! Team Leader Amy Dennett of Marshfield and Jamal Noshahi of Somerville were also among our group members. They have been with Blue Cross Blue Shield for 2 ½ years and 4 months, respectively, and work in several different capacities. All in our group, including Julie, of Hull, who has been with Blue Cross Blue Shield in various positions for time totaling 8 years (! 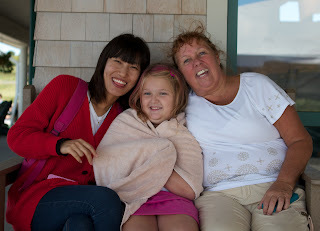 ), approached our assigned tasks with gusto, and expressed their enjoyment of being outside and on the beach. Want to visit Carson Beach? For more information, click here. Congrats Blue Cross Blue Shield on 75 years of service! For more information on their community efforts, check out this page. 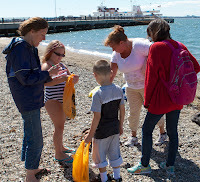 On Saturday, September 15 - with the summer season coming to a close - I joined Save the Harbor / Save the Bay and 278 guests on a free trip to discover the Treasures of Spectacle Island in the Boston Harbor Islands National Park. Though the day began with grey skies, the sky was clear by the time the Provincetown II departed from Bay State Cruise Company's dock at the World Trade Center. I spent most of my time on the island taking pictures of the kids and families, many of whom took part in our free youth environmental education programs this summer, as they explored the island. You can see my photos - and other photos taken by our other interns as well - at Save the Harbor's photobucket site. Everyone I spoke with had a great day on the island and on the harbor - and left the boat with some great memories and stories to share with their friends and family - though they did have to leave the cool things they found - like beach glass and artifacts - on the beach. While we were on the pier, Save the Harbor's Director of Communications Bruce Berman interviewed Park Ranger Elliott Higger of the Department of Conservation and Recreation, who has been residing in a yurt on Spectacle Island all summer. Though her yurt had no running water or electricity, Elliot had a great time sharing the sights and sounds of the island she has called home this summer with visitors from around the region and across the country. It was undoubtedly a summer she will never forget. I will also post an interview I shot of DCR's Archaeologist Ellen Berkland sharing some of her remarkable stories of island life sometime soon! Policy Intern / Photographer / Videographer! 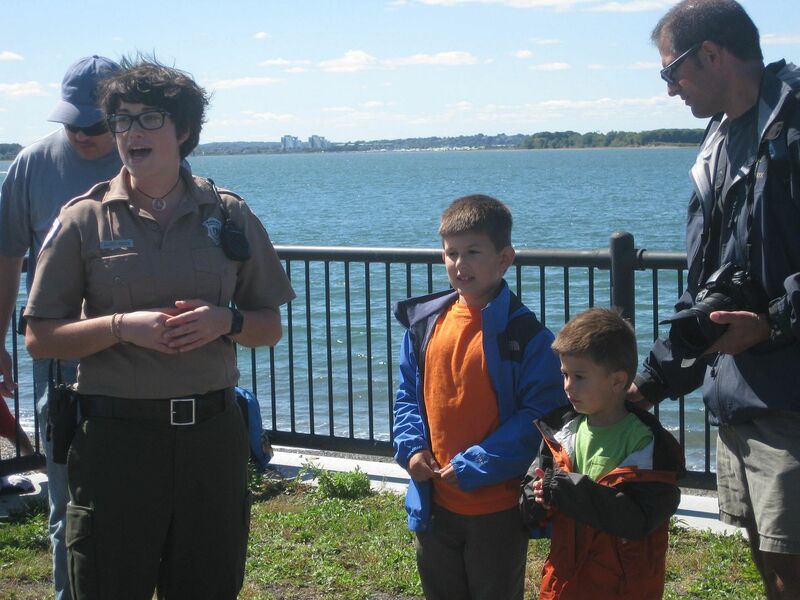 On Spectacle Island, Stewardship, and Treasure! Hi all! 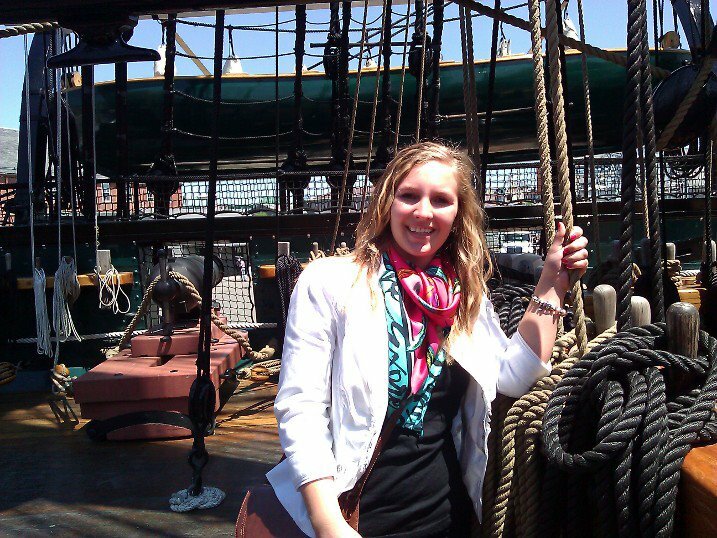 My name is Megan, and I'm a new Development Intern for Save the Harbor/Save the Bay. We came back together as a group to share our findings and were also treated to some archaeological history of the island and artifacts, courtesy of Ellen. Once we'd all shared our favorite treasures (all very different! ), Elliott tasked us with making mosaics with our finds. Jactyne, age 4, of Dorchester, created this heart with a castle inside. 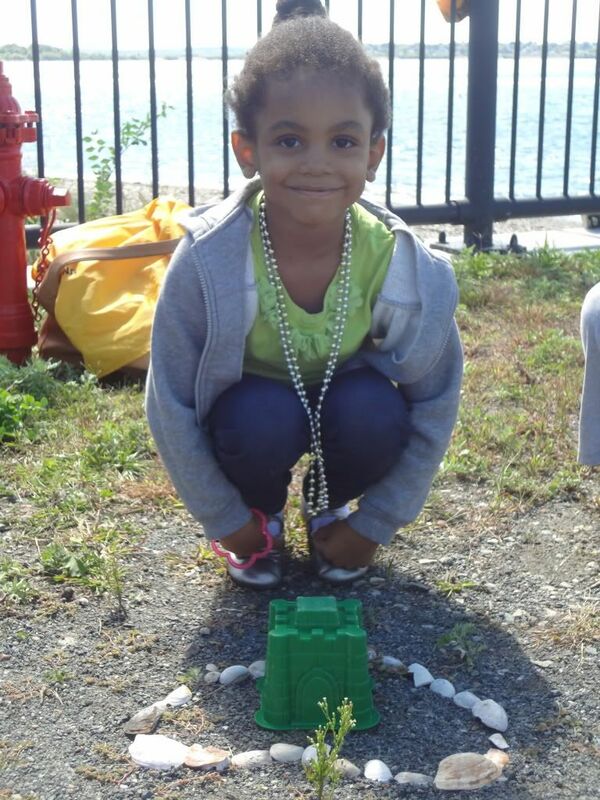 This was her first trip to Spectacle Island with her mother and sisters. 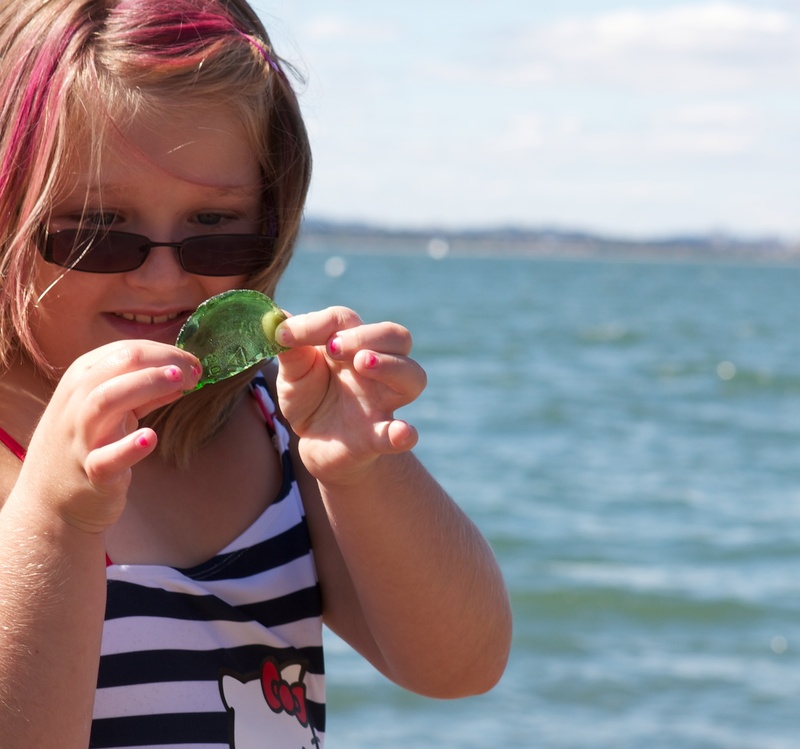 Jactyne told me that her favorite treasure was a blue mussel shell, "because it's blue!" 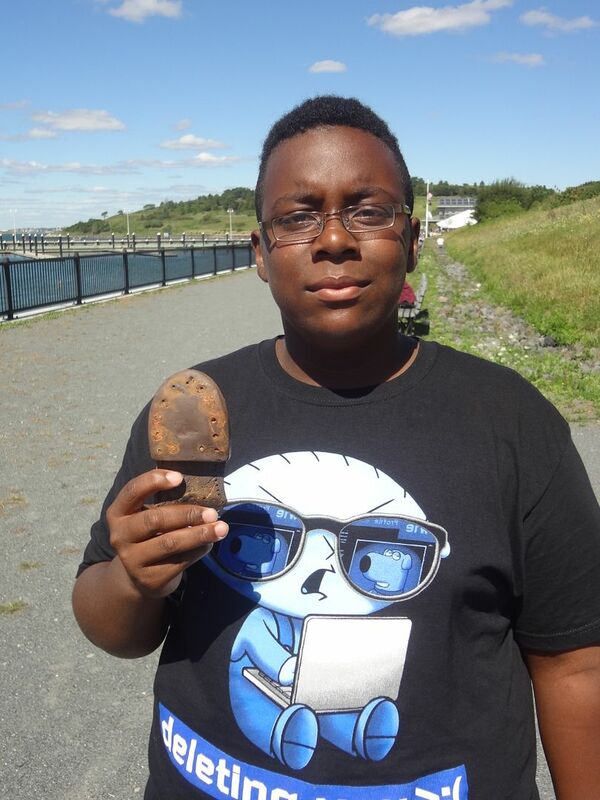 Elijah, of Mattapan, contributed both this treasure, a shoe sole, and a feather to our abstract mosaic - his finds completed our effort! Katherine, of Quincy, filled her pail (to the brim!) with shells and also found a set of dentures, with which she made a sea turtle. Merriam-Webster's online dictionary defines treasure as “something of great worth or value” - In addition to the Sea Glass Explorer Certifications our group received (see below! ), we take home stories to share about the people we met, pictures of sea glass (or dentures!) that we found, and overall, the memory of enjoying being outside and on Boston Harbor. Thank you to all of those who made it out to Spectacle Island with us – you truly made it a treasure of a day! Friends and families boarded the Provincetown II on a cloudy Saturday morning and set off to the lovely Spectacle Island with friends at Save the Harbor. As the boat approached the Island dock, the clouds parted and sunshine lit up the sandy beach, grassy hills, and sparkling water. After capturing a quick group photo on the dock, kids sprinted to beach and up hiking trails to explore Spectacle's many treasures. 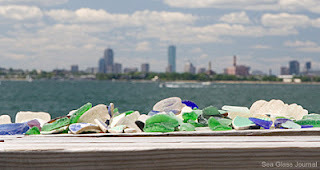 The day was filled with leisurely walks on the beach, spectacular views of Boston and other Harbor islands from the top of the hills, and sea glass mosaic-making! There is nothing like the view from the Spectacle’s summit; this is a must-see sight for any Boston-lover. The sea glass mosaic activity was my favorite part of the day. It was so entertaining to watch all the kids searching through the glass to find their favorite pieces then compiling them together to compose some beachy works of art. 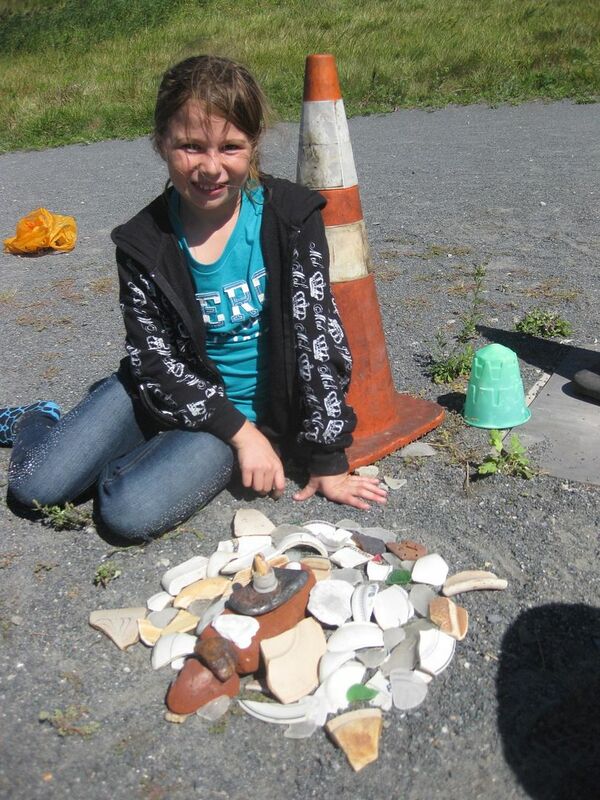 Some of the treasures included painted pottery, various colors of sea glass, and even old horse shoes! Katherine from Quincy found multiple treasures on the beach, including a crab leg, and used her sea glass finds to compose a tortoise! 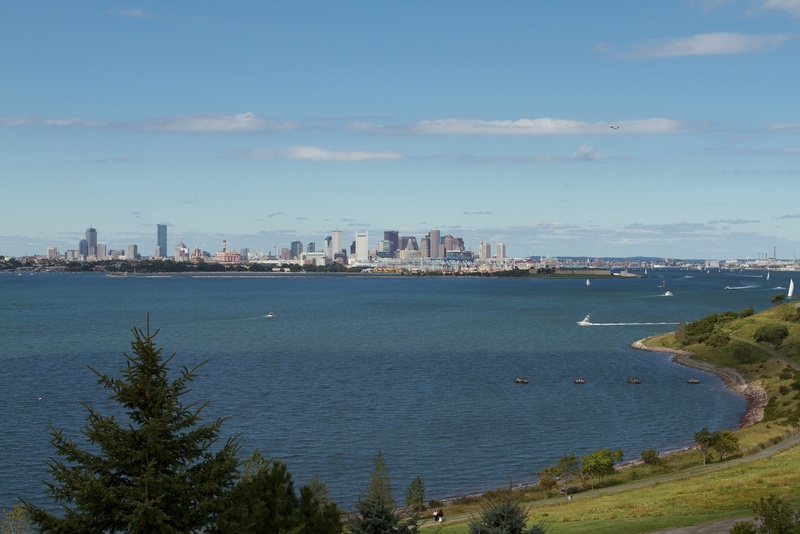 Since the early 2000s, Spectacle Island has transformed from an unsightly trash site to an alluring public amenity as part of the Boston Harbor Islands National Recreation Area. Park rangers continue to emphasize the importance of picking up trash and recycling, and the park even hosts composting toilets! Seeing Spectacle now, in 2012, it’s hard to believe how recent its transformation was. Spectacle offers a close but exciting getaway for people looking to spend a day on the beach. It is definitely a destination for those seeking to enjoy a unique perspective of our wonderful Boston Harbor. Nearly 300 people braved the wind and rain to board the Provincetown II for the trip out to Spectacle Island, yet no sooner had we docked than the clouds parted, giving way to blue sunny skies and a light breeze to cool us as we ventured about the island’s ample trails photographing the spectacular views of the harbor and skyline. The island is made up of two "drumlins" or little ridges. Amazingly, this beautiful spot was built of decades of garbage and the dirt and clay left over from the Big Dig. Talk about recycling! On the way down from the summit I met and picnicked with a wonderful family- Patti and her granddaughter Madison (or Maddie for short) along with Ellie, a Korean exchange student staying with them. Patti lives in Winthrop and she spends lot of her free time with Maddie, they enjoy doing things together like crabbing and fishing. We agreed to help Maddie on her search for the items on the scavenger hunt. 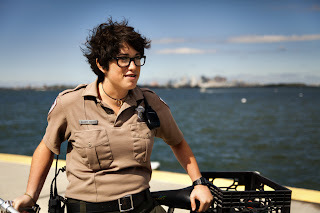 While walking along the beach searching for a feather, Patti told me that in all her time living here she had yet to have the opportunity to check out Spectacle Island. She thought it was great that Save the Harbor / Save the Bay was giving her and Maddie the opportunity to explore the island. As we diligently assisted Maddie on her search for other items on the scavenger hunt list- some sea glass (and boy is there a lot of it! ), seaweed, and a whole shell among others; we also managed to do some good for this state treasure, collecting a shopping bags worth of trash from the shoreline. It’s amazing the things that can find their way down drains and across the harbor. We collected candy wrappers, a water bottle, and some small plastic trinkets. It should really make people think twice about what they toss on the ground or in the water. Treasure hunting is best with friends! The call came through the speakers letting us all know that it was time to board the boat again. We brought our sea glass and other relics into the ranger’s desk, you can’t take those treasures with you, they belong to the people. As the boat pulled away, leaving beautiful Spectacle Island behind, we all agreed that we would be back to this special spot just 4 miles, yet seemingly a world away from the hustle and bustle of downtown Boston. I have to say, my first trip to Spectacle Island was quite a success. Although the day started out rainy and cloudy, the sun eventually came out to brighten up everyone’s experience. After leaving the ship, the Save the Harbor crew and our guests were able to explore one of the Boston harbor’s most exciting islands. 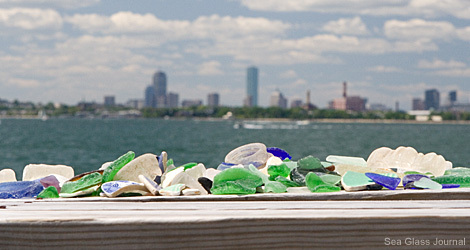 All of the beaches were full of sea glass and other Treasures of Spectacle Island. 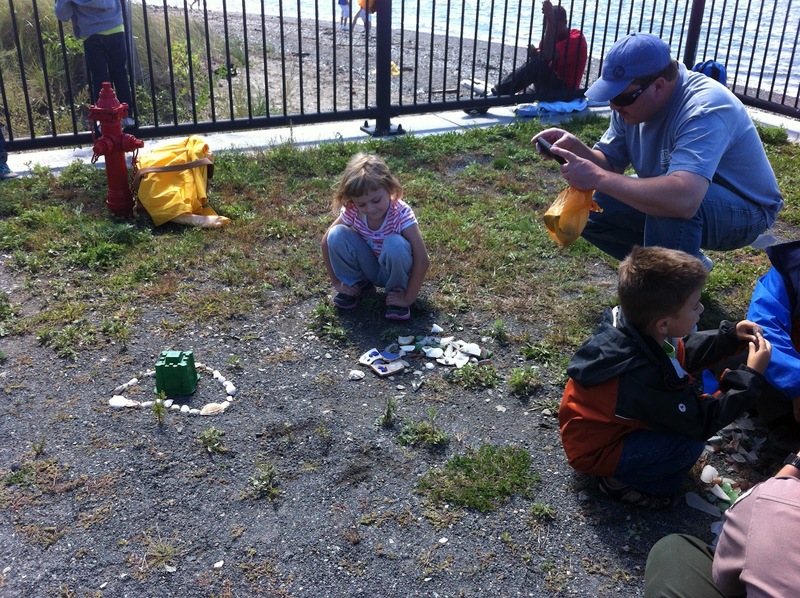 Families from all over the Boston area took the task of finding the most interesting pieces of shell and glass on the beach to create their own mosaic. Dylan and his mother, Anne Marie, from Quincy were particularly successful in finding a whole bucketful of materials to work with. 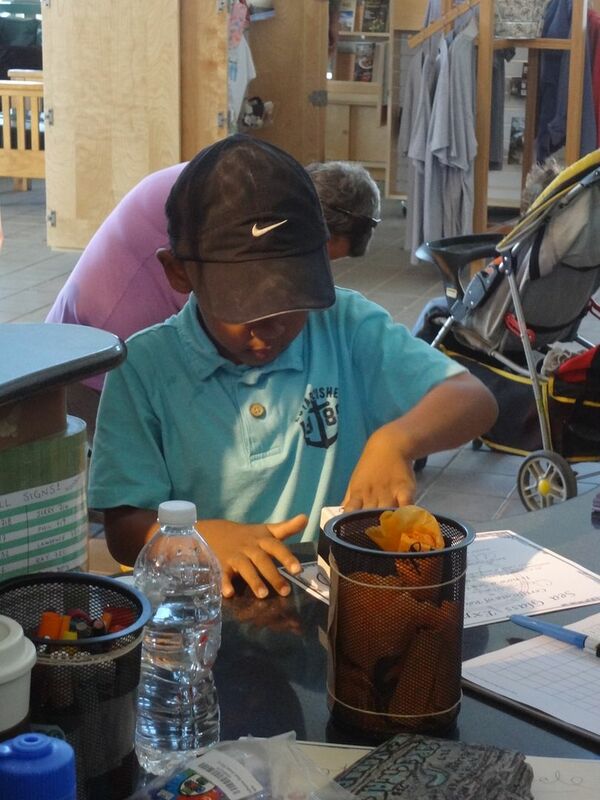 Once all of the treasures had been gathered, kids then used their creativity to shape the perfect design. 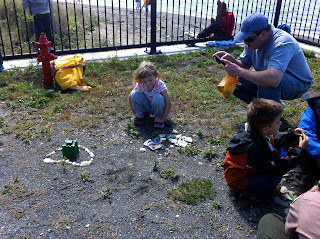 Little Gracie and her father made a fortress out of their sea glass. More surprisingly, these boys and their father from used their sea glass to form the US constitution. Talk about your over-achievers! Of course, the trip was not all fun and games. 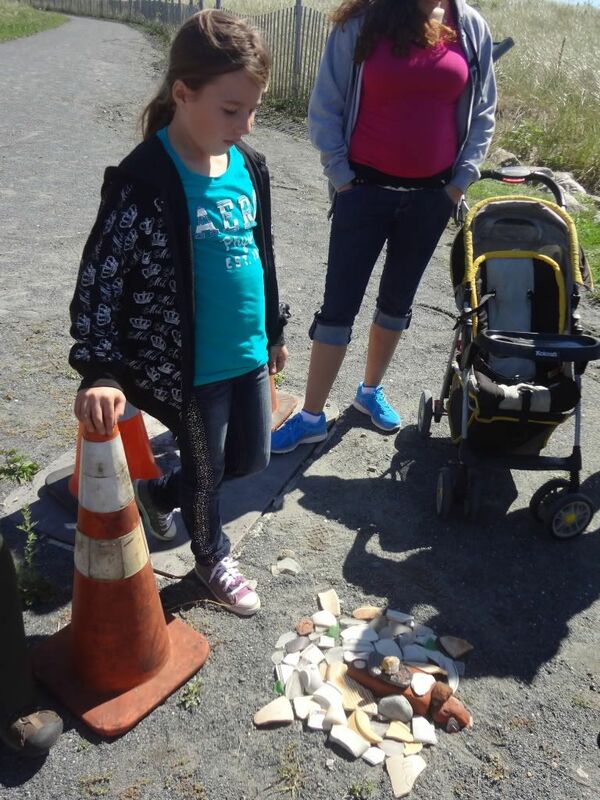 An important part of each activity was also finding trash and picking it up. Park Ranger Elliot, challenged each and everyone one of us to collect at least five pieces of trash. You might also find it interesting that there is not one trash bin on Spectacle Island, instead it is the visitors duty to bring all trash with them back off of the island. Finally, one of the other highlights of the day had to be the hike to the summit of the island. 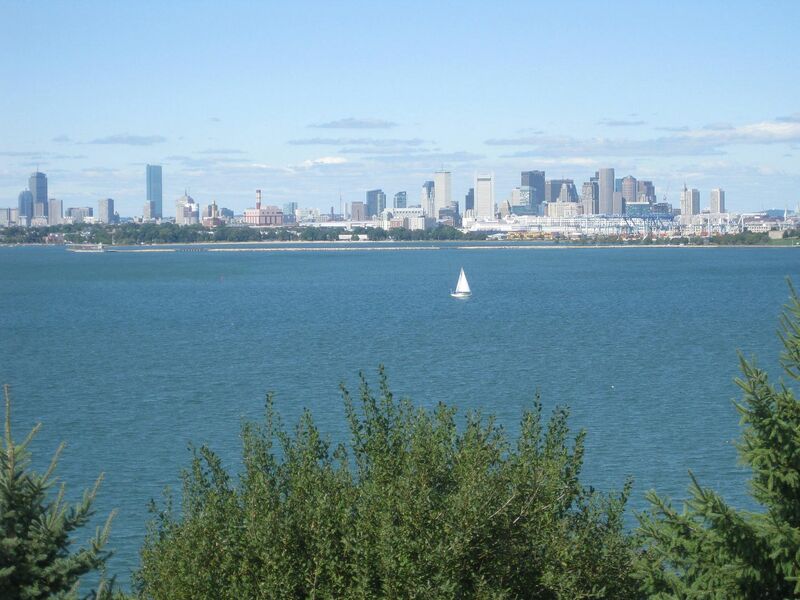 Once we reached the top, my fellow interns and I were treated to a beautiful view of the Boston skyline. All in all, I cannot wait until my next trip to Spectacle Island. 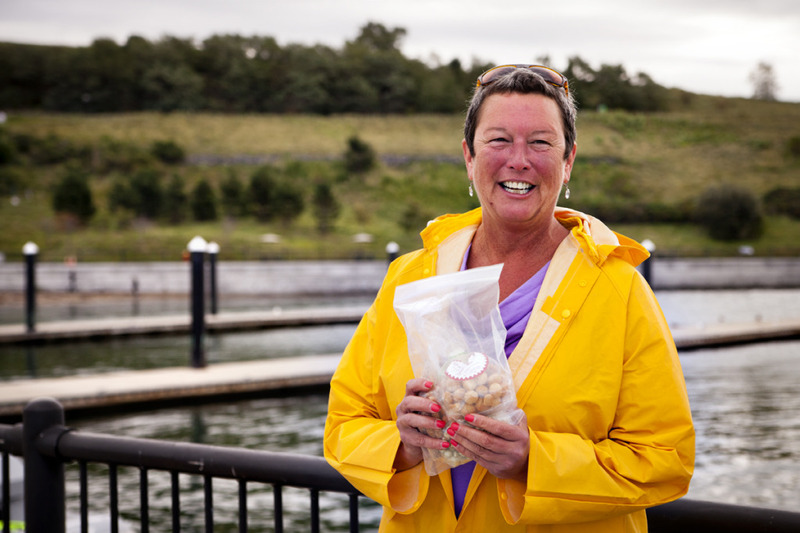 Join Save the Harbor for a free cruise and treasure hunt on Spectacle Island! On Saturday, September 15th, Save the Harbor / Save the Bay would like you, your family and your friends to join as we set sail on a free cruise to discover the "Treasures of Spectacle Island". 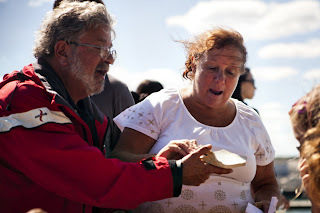 The cruise will be narrated by Save the Harbor's BayWatcher Bruce Berman and DCR Archaeologist Ellen Berkland, and will be led by Save the Harbor's youth program staff, who this year brought 6,000 youth and teens from across the city and around the region to Spectacle and Georges Island as part of their free "All Access Boston Harbor" program. There will be refreshments available for sale on the boat and at Jasper White's Summer Shack on Spectacle, though you are welcome to pack your own picnic lunch and bring it with you on the trip. After the cruise, we encourage you to share your stories and photographs of your island adventure and the treasures you discovered with us on our page on facebook or send them to us by email to info@savetheharbor.org. If we choose your story, you will win a blue beach glass marble - and a chance to win 40,000 TrueBlue points from JetBlue Airways as part of our "Simply Marble-ous" treasure hunt, which runs through Columbus Day. So bring a camera, a picnic lunch and your friends and family and enjoy a great day in the Boston Harbor Islands National Park with Save the Harbor / Save the Bay! We hope to see you on Boston Harbor on the 15th! PS. Though there is plenty of room on the boat, reservations are required. Save the Harbor also appreciates funding support from Blue Cross Blue Shield of Massachusetts, The Dolphin Trust, Alice W. Dorr Foundation, Massachusetts Bay Lines, National Grid Foundation, John Hancock Financial Services, Lawrence J. & Anne Rubenstein Charitable Trust, Arbella Insurance Group Charitable Foundation, Boston Bruins Foundation, Carnival Foundation, Clipper Ship Foundation, Inc., Jay Cashman, Inc., Mass Humanities, Bank of America Pavilion, Circle Furniture, Fuller Foundation, Thomas & Lucinda Foley, Lovett-Woodsum Family Charitable Foundation Inc., South Boston Community Development Corporation, Andus Baker & Rowan Murphy Family Foundation, Boston Centers for Youth and Families, Department of Conservation and Recreation, Martha Mazzone Charitable Gift Fund, Matthew J. & Gilda Strazzula Foundation, Bryce & Maryann Suydam, Community-Suffolk, Inc., DeMarco Produce, Miami Free Zone/Cargo Ventures and hundreds of individual small donors."